The 21" Organic is a bright but dry all-rounder that will beguile your sonic taste buds. Bright sound won't suit all. Cymbal variations just keep on coming, and it is to the manufacturers' credit that each addition has something unique to offer. 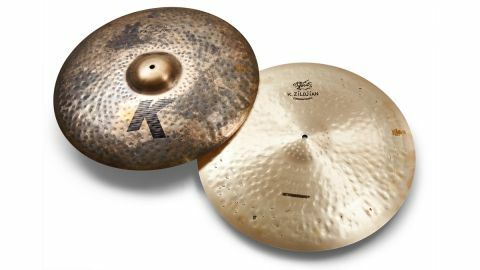 Zildjian has had a particularly fruitful past couple of years with the introduction of the vintage style K Keropes, and here come two more special Ks, the first of which is the K Custom Organic. The 21" ride was designed in conjunction with versatile drummer and educator Pat Petrillo. The Custom Organic ride is certainly an eye-catching cymbal. It has a unique wire-brushed top, which leaves a mottled brown and orange-gold surface with an aged powdery patina. Underneath though it's a modern-day smoothie with a highly polished brilliance. The rounded bell is well-proportioned, and the rest of the cymbal is mercilessly hammered. The Organic Ride is exceptionally dry. Zildjian says that the unique wire-brushed surface imparts a raw sound, while the brilliant underside opens things up for crashing without washing out. Our immediate impression was of a precise ride with a medium arid character over a warmer spread, and a noticeably short-lived crash, with the bell loud and stinging. You can certainly play jazz on it, but there's the power and the edge to work in heavier, lairier contexts too. There's also an abrasiveness that surmounts the other instruments in the band. Pat Petrillo isa powerful drummer with a tasty line in everything from New Orleans grooves through classic soul to Broadway shows, and this cymbal has the versatility to cover all of that. The bright - you could even say tinny - stick response is emphasised by the starkly dry and short sustain, but clears away to reveal a darker, more sumptuous element lurking underneath.